Steven (Chicagoland, United States) on 16 April 2015 in Plant & Nature and Portfolio. Photo captured March 21, 2015. Lovely crisp colours against the dark background. I like the graceful curve of the stem - shape and line are in the Ikebana style of arrangement. A fine composition that is very well shot. Gorgeous colors. 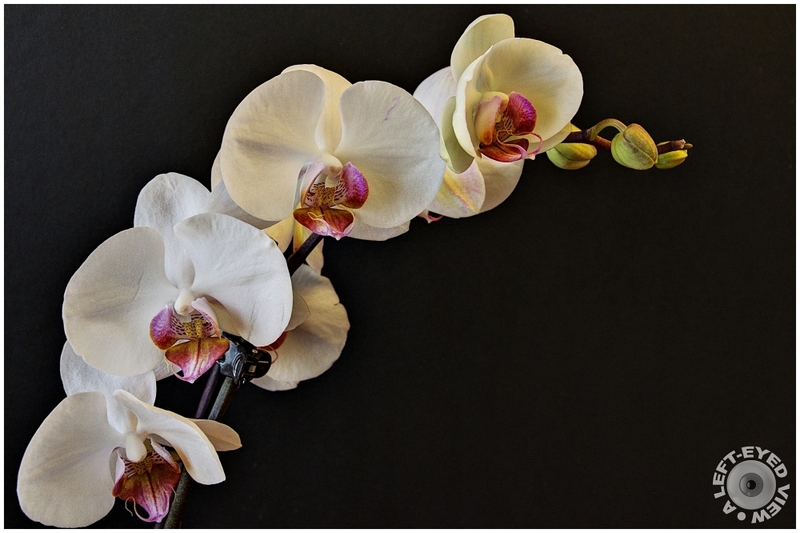 Wonderful "Phalaenopsis" beautifully highlighted against the dark background ... Splendid image !!! Very good contrast with the background. Nice isolation in this beautiful image. I like the framing and how the orchids travel through the frame. That is gorgeous. I love it. Beautifully composed! This is just gorgeous! Beautiful blooms, and your careful placement of them in an arc along the edges of the frame is fine composition. Great capture on the black foreground, like the contrast. Gorgeous blooms and colors ... beautiful capture! Beautiful capture of these elegant orchids!! !